Now that September's over, I've come to round up all of my crushes for this past month! 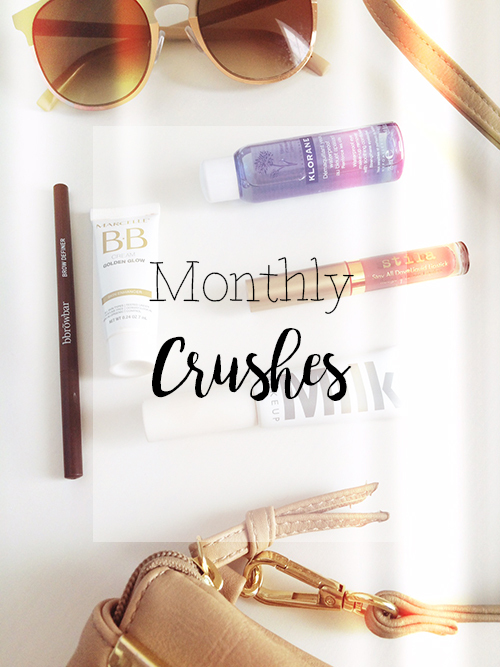 Unsurprisingly, this month's crushes all come from Birchbox! I am honestly loving this service and I can say nothing but good things about the products I've received over the past few months. Although I love all the beauty products I've gotten through Birchbox, these are the ones I've been crushing on the hardest this past month. I've never filled in my brows until I got this pencil. I think it's definitely a great product to use if you're new to the brow world like me. It doesn't smudge and lasts all day; I loved it so much, I had to buy another! Heart eyes for daaays. I love this color on me so much, and it's a great color for fall, too. It lasts pretty long and I've only ever had to slightly reapply it a few times. Definitely see myself getting more of this later in the season! Praise the lord that this BB cream came into my life. It is by far the best one that I've used in a while. It's a little thicker than most BB creams, so I feel comfortable going out in just this and a little concealer. This cream definitely gave me that end-of-summer glow that I was hoping for, and I'm so happy with it that it's worth getting another! I've talked about this product in my Birchbox review, and I loved it so much that I had to add it to my monthly crushes list! I love me some waterproof mascara, but it definitely puts up a fight when I take it off at the end of the day. This makeup remover makes it so much easier and even strengthens eyelashes! Another one featured in my Birchbox review post. This is the mascara of the gods. Literally. Because whenever I apply it, my lashes have so much volume, they're high-fiving Jesus. It's so lightweight as well, so my eyelashes don't feel clumpy or heavy. Honestly, what more do you want out of a mascara? This one definitely delivers. What are some of your favorite products that you've been crushing on this month? Quote of the day: "Celebrate the little wins." They're so great--I highly recommend them! And no problem!